Braces aren’t just for kids! Adults and children can benefit from a beautiful smile and proper bite. Dr. Frerich uses the Tip Edge™ orthodontic system which allows for a quicker completion of treatment and far less discomfort. 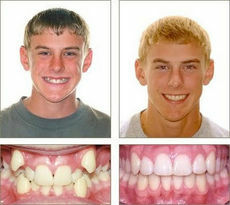 ClearCorrect is the clear choice alternative to metal braces. If you are looking for a clear and convenient option, we are proud to offer ClearCorrect to help give you the healthy, straight smile you desire.